The reviewer received an e-galley from the publisher. Rebecca L. Johnson has made a name for herself as an outstanding writer of science books for children. Journey to the Deep won an Orbis Pictus Honor Award in 2011, and Zombie Makers was an ALA Notable Children's Book in 2013. 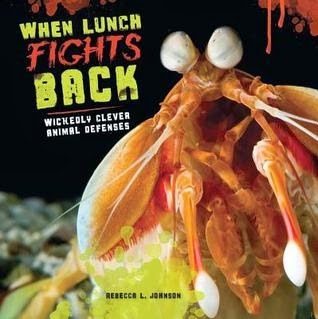 In her latest nonfiction book for middle grade readers, Johnson turns her attention to animal adaptations and defense mechanisms. When Lunch Fights Back will hook readers from the first chapter entitled, "Slip-Sliming Away." Readers learn how the hagfish produces strings of slime when predators attack. A close-up color photo shows slime oozing from the body of a hag fish. In each chapter, Johnson introduces readers to an animal and its defense mechanism and then explains "The Science Behind the Story." Some of the other animals featured in the book include the African hairy frog with a concealed claw-like bone, the hoopoe chicken which shoots feces at enemies, and the Texas horned lizard that squirts blood out of its eyes. Johnson also adds information scientists who are studying the creatures and their defense mechanisms. The narrative writing style includes vivid descriptions making this a book that could serve as a mentor text for informational writing. "In a blur of movement, the shark strikes. It grabs the hagfish in its toothy jaws- and instantly lets go. The shark's mouth is overflowing with thick, snot-like goo. The slimy stuff fills its throat and clogs its gills." 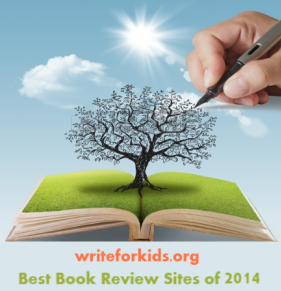 The layout of the book is ideal for young readers. Photos, captions and fact boxes are well-placed without interrupting the flow of the text. The black paper used at the beginning of each chapter with contrasting neon green headings and white text will definitely capture the attention of readers. Back matter includes a glossary, bibliography and companion books and videos. When Lunch Fights Back is a complete package. It's sure to please science teachers looking for an engaging narrative text for the classroom, and it's will definitely be popular with children who want to reading about interesting, unusual and sometimes disgusting animals.